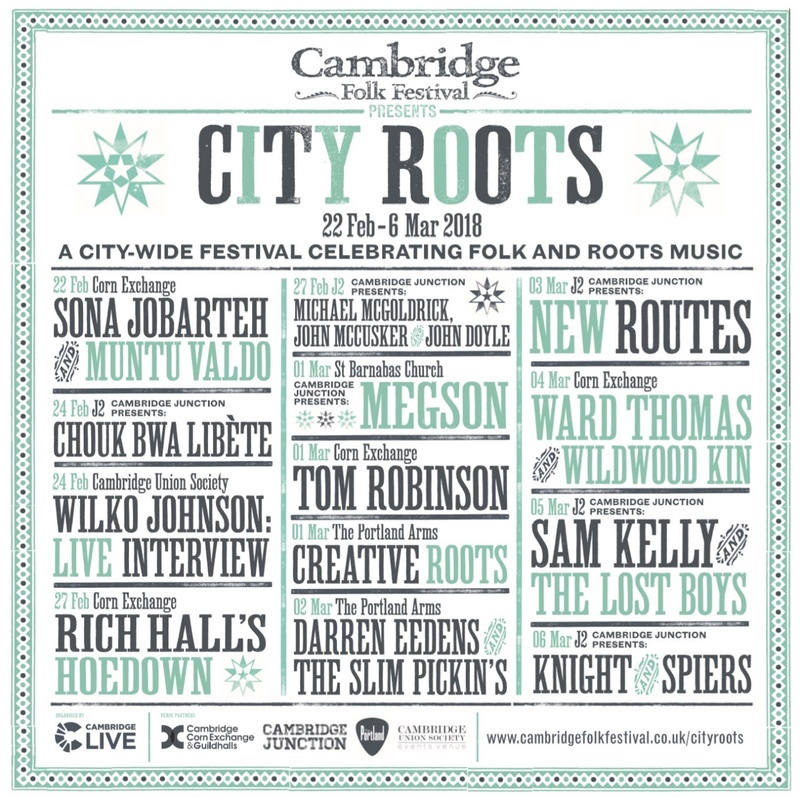 THE spirit of the world-famous Cambridge Folk Festival will inject the city with winter cheer in February and March, when Cambridge’s second city-wide winter folk and roots festival opens for two weeks of exceptional music and events. An all-encompassing Corn Exchange line-up includes: the soaring, Gambian sun-drenched chords of stunning Kora virtuoso and opening Festival headliner, Sona Jobarteh performing alongside Cameroon’s blues and jazz artist Muntu Valdo; the Americana-tinged sound of Wildwood Kin – crowned this year as legendary broadcaster Bob Harris’s ‘Emerging Artist of the Year’ – supporting Cambridge Folk Festival summer headliner, Ward Thomas; award-winning comic Rich Hall performing Hoedown – a withering dissection of Trump’s America which finishes as a celebration of Americana with stand-up, improvised ballads, and amazing musicianship…’Blissfully funny’ (The Guardian) and Cambridge born Tom Robinson with the 2-4-6-8 Motorway 40th Anniversary show. Tom is one of the founding team for BBC Radio 6, where he hosts three shows a week and has become known as a champion of new emerging artists via BBC Introducing. At Cambridge Junction, an array of City Roots music is on offer: Chouk Bwa Libète bring drums, poetry and trance from Haiti’s vodou heartland; BBC Radio 2 Folk Awards winners Sam Kelly & The Lost Boys rediscover and renew the music of Sam’s gaelic heritage, transcending boundaries of trad and popular music; Cambridge Folk Festival favourites and three of the world’s finest folk musicians, Michael McGoldrick, John McCusker and John Doyle set the stage alight playing material from their latest album, The Wishing Tree and legendary ex-Steeleye Span fiddle player, Peter Knight joins forces with John Spiers, one of the leading melodeon players of his generation for an unmissable gig. Cambridge Junction also presents a very special evening at St Barnabas Church featuring BBC 2 Radio 2 Folk Award nominees Megson. Appearing at renowned city music venue, The Portland Arms will be folk festival Club Tent sensation, Darren Eedens & The Slim Pickin’s – whether they’re held spellbound by a poignant ballad or jumping up and down as one to a stomping groove, Darren’s command of an audience is absolute! Following the success of last year’s Creative Roots, the festival’s valuable professional development day will be held at The Portland Arms. Music industry professionals will once again gather to offer a career development day of workshops, talks and sessions, offering gems of advice and a wealth of experience. Drop-in music sessions around the city; a special City Roots Family Day with free attractions including craft workshops, face-painting, storytelling, ‘Come and Try’ ukulele workshop and fun walkabout characters; plus what promises to be a sell-out City Roots highlight – a fascinating live interview, in association with the Cambridge Union Society, with charismatic Canvey Island rocker Wilko Johnson – and it’s safe to say City Roots will be one of the most anticipated events in Cambridge in 2018!